HOW WE SELL HOMES LIKE YOURS. Download "HOW WE SELL HOMES LIKE YOURS. www.brazensir.com"
1 HOW WE SELL HOMES LIKE YOURS. 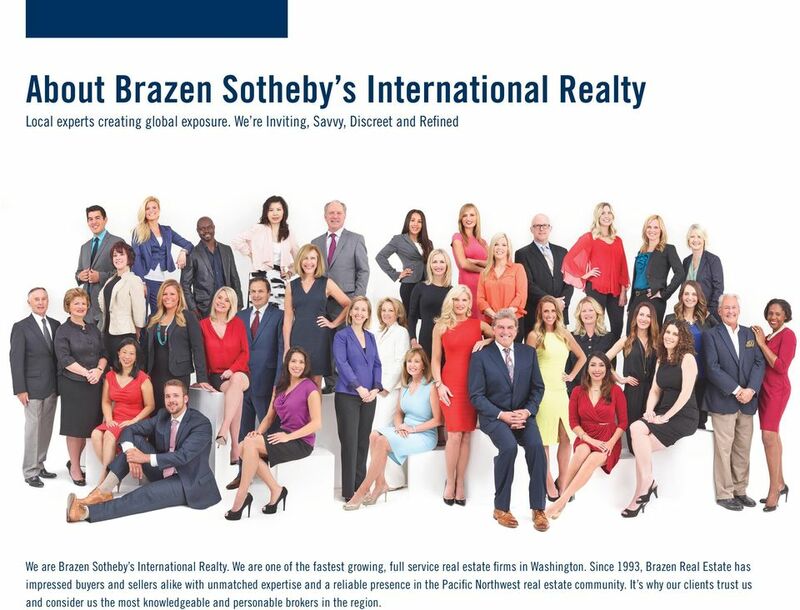 2 About Brazen Sotheby s International Realty Local experts creating global exposure. We re Inviting, Savvy, Discreet and Refined We are Brazen Sotheby s International Realty. We are one of the fastest growing, full service real estate firms in Washington. 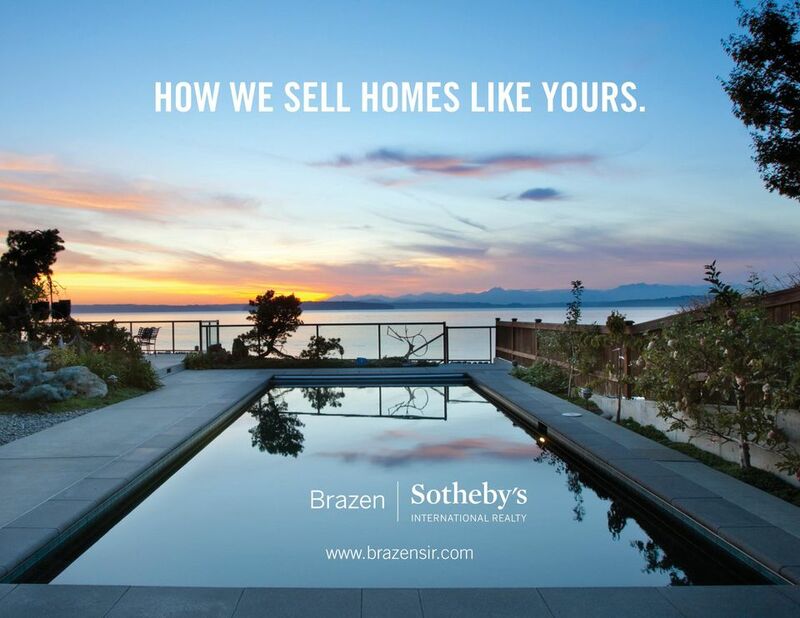 Since 1993, Brazen Real Estate has impressed buyers and sellers alike with unmatched expertise and a reliable presence in the Pacific Northwest real estate community. It s why our clients trust us and consider us the most knowledgeable and personable brokers in the region. 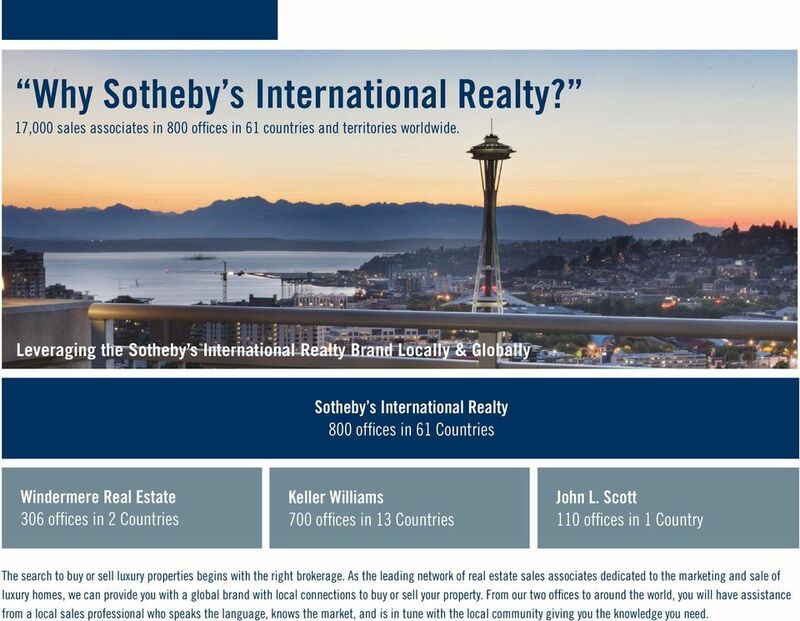 3 Why Sotheby s International Realty? 17,000 sales associates in 800 offices in 61 countries and territories worldwide. Leveraging the Sotheby s International Realty Brand Locally & Globally Sotheby s International Realty 800 offices in 61 Countries Windermere Real Estate 306 offices in 2 Countries Keller Williams 700 offices in 13 Countries John L. Scott 110 offices in 1 Country The search to buy or sell luxury properties begins with the right brokerage. 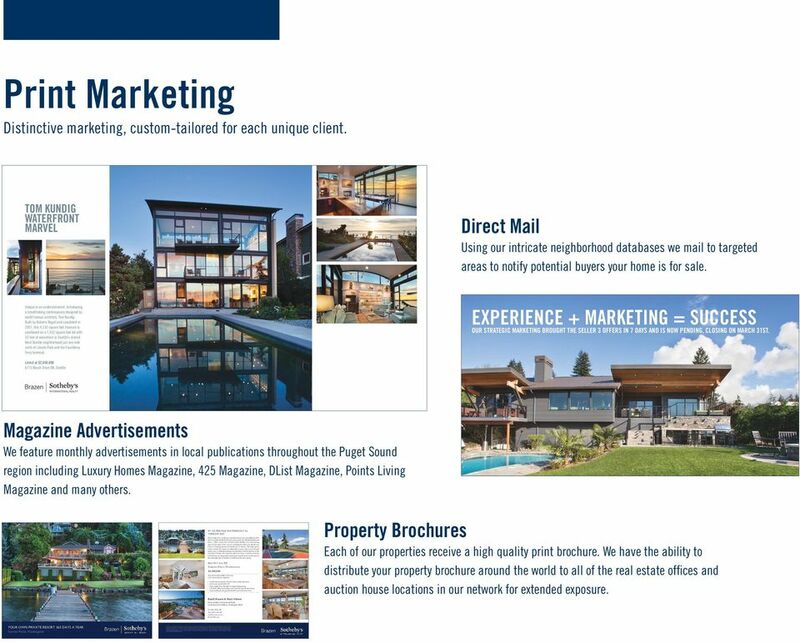 As the leading network of real estate sales associates dedicated to the marketing and sale of luxury homes, we can provide you with a global brand with local connections to buy or sell your property. From our two offices to around the world, you will have assistance from a local sales professional who speaks the language, knows the market, and is in tune with the local community giving you the knowledge you need. 4 Determining The Value Of Your Home Our brokers are highly trained and skilled in doing the research to provide you with the most up to date property evaluation. 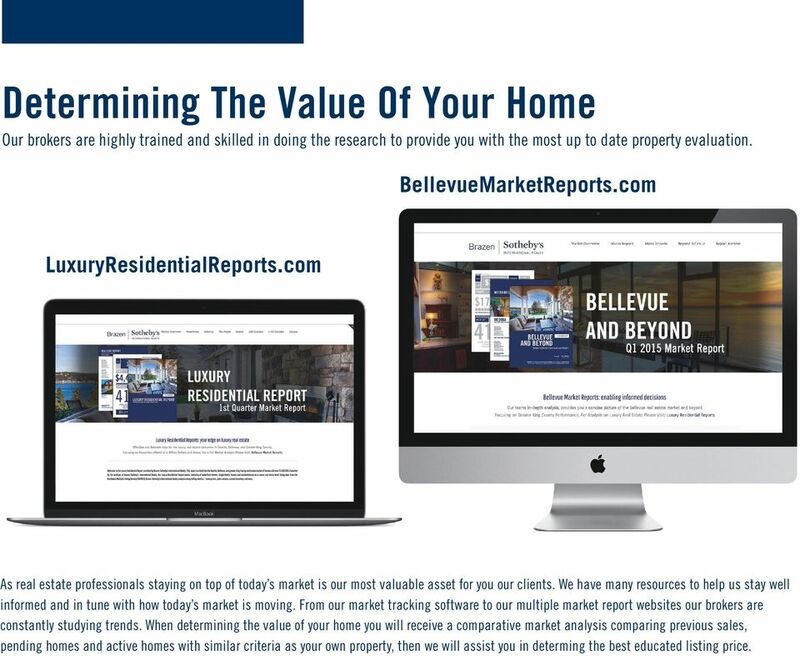 BellevueMarketReports.com LuxuryResidentialReports.com As real estate professionals staying on top of today s market is our most valuable asset for you our clients. We have many resources to help us stay well informed and in tune with how today s market is moving. From our market tracking software to our multiple market report websites our brokers are constantly studying trends. When determining the value of your home you will receive a comparative market analysis comparing previous sales, pending homes and active homes with similar criteria as your own property, then we will assist you in determing the best educated listing price. 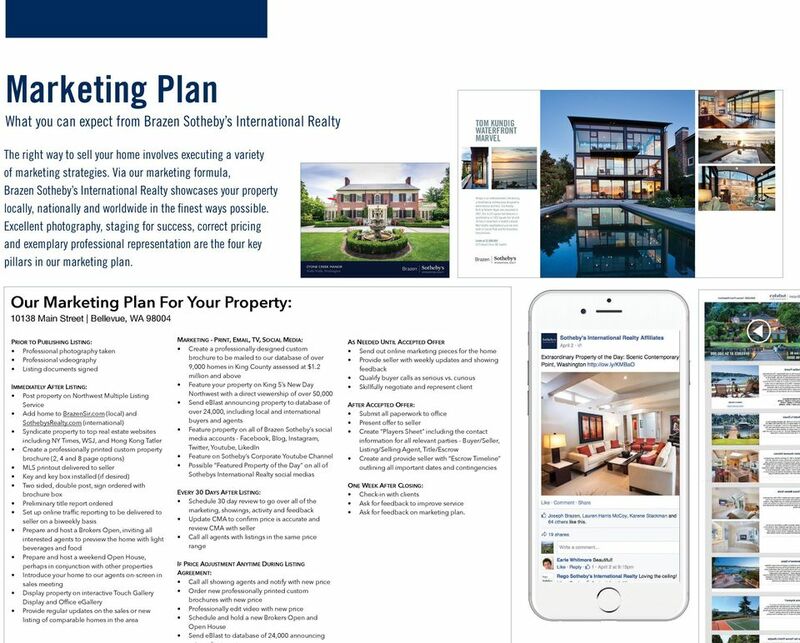 5 Marketing Plan What you can expect from Brazen Sotheby s International Realty TOM KUNDIG WATERFRONT MARVEL The right way to sell your home involves executing a variety of marketing strategies. 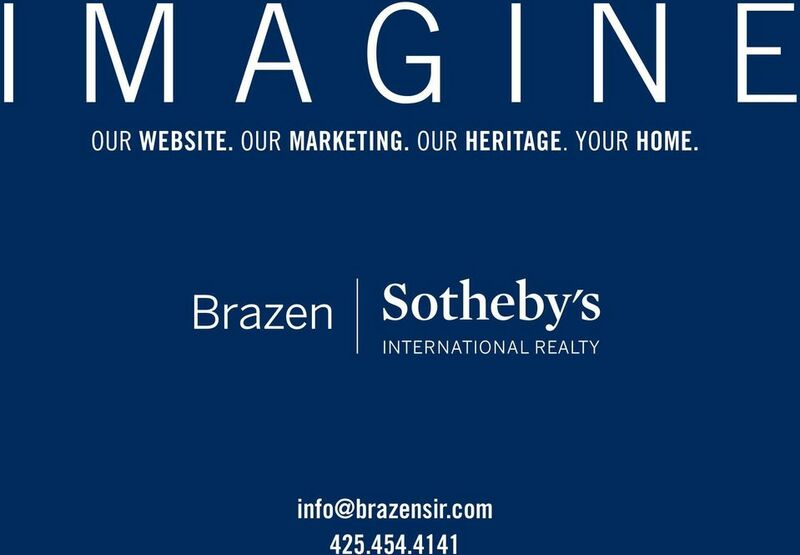 Via our marketing formula, Brazen Sotheby s International Realty showcases your property locally, nationally and worldwide in the finest ways possible. Excellent photography, staging for success, correct pricing and exemplary professional representation are the four key pillars in our marketing plan. Unique is an understatement. Introducing a breathtaking contemporary designed by world famous architect, Tom Kundig. Built by Roberts Wygal and completed in 2007, this 4,110 square foot treasure is positioned on a 7,452 square foot lot with 50 feet of oceanfront in Seattle s storied West Seattle neighborhood just one mile north of Lincoln Park and the Fauntleroy Ferry terminal. Listed at $2,850, Beach Drive SW, Seattle BUYERS AGENT RANDI BRAZEN Our Marketing Plan For Your Property: Main Street Bellevue, WA PRIOR TO PUBLISHING LISTING: Professional photography taken Professional videography Listing documents signed IMMEDIATELY AFTER LISTING: Post property on Northwest Multiple Listing Service Add home to BrazenSir.com (local) and SothebysRealty.com (international) Syndicate property to top real estate websites including NY Times, WSJ, and Hong Kong Tatler Create a professionally printed custom property brochure (2, 4 and 8 page options) MLS printout delivered to seller Key and key box installed (if desired) Two sided, double post, sign ordered with brochure box Preliminary title report ordered Set up online trafﬁc reporting to be delivered to seller on a biweekly basis Prepare and host a Brokers Open, inviting all interested agents to preview the home with light beverages and food Prepare and host a weekend Open House, perhaps in conjunction with other properties Introduce your home to our agents on-screen in sales meeting Display property on interactive Touch Gallery Display and Ofﬁce egallery Provide regular updates on the sales or new listing of comparable homes in the area MARKETING - PRINT, , TV, SOCIAL MEDIA: Create a professionally designed custom brochure to be mailed to our database of over 9,000 homes in King County assessed at $1.2 million and above Feature your property on King 5 s New Day Northwest with a direct viewership of over 50,000 Send eblast announcing property to database of over 24,000, including local and international buyers and agents Feature property on all of Brazen Sotheby s social media accounts - Facebook, Blog, Instagram, Twitter, Youtube, LikedIn Feature on Sotheby s Corporate Youtube Channel Possible Featured Property of the Day on all of Sothebys International Realty social medias EVERY 30 DAYS AFTER LISTING: Schedule 30 day review to go over all of the marketing, showings, activity and feedback Update CMA to conﬁrm price is accurate and review CMA with seller Call all agents with listings in the same price range IF PRICE ADJUSTMENT ANYTIME DURING LISTING AGREEMENT: Call all showing agents and notify with new price Order new professionally printed custom brochures with new price Professionally edit video with new price Schedule and hold a new Brokers Open and Open House Send eblast to database of 24,000 announcing LISTING AGENT JOSEPH BRAZEN Downtown Main Street Bellevue, WA Eastside NE 8th Street, K8 Bellevue, WA Joseph Cell Randi Cell AS NEEDED UNTIL ACCEPTED OFFER Send out online marketing pieces for the home Provide seller with weekly updates and showing feedback Qualify buyer calls as serious vs. curious Skillfully negotiate and represent client AFTER ACCEPTED OFFER: Submit all paperwork to ofﬁce Present offer to seller Create Players Sheet including the contact information for all relevant parties - Buyer/Seller, Listing/Selling Agent, Title/Escrow Create and provide seller with Escrow Timeline outlining all important dates and contingencies ONE WEEK AFTER CLOSING: Check-in with clients Ask for feedback to improve service Ask for feedback on marketing plan. 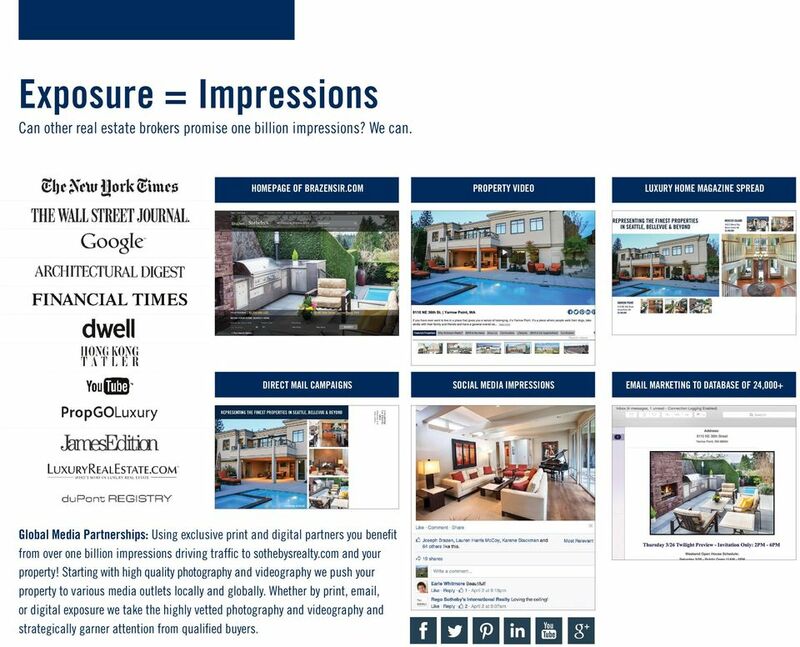 6 Exposure = Impressions Can other real estate brokers promise one billion impressions? We can. HOMEPAGE OF BRAZENSIR.COM PROPERTY VIDEO LUXURY HOME MAGAZINE SPREAD DIRECT MAIL CAMPAIGNS SOCIAL MEDIA IMPRESSIONS MARKETING TO DATABASE OF 24,000+ Global Media Partnerships: Using exclusive print and digital partners you benefit from over one billion impressions driving traffic to sothebysrealty.com and your property! Starting with high quality photography and videography we push your property to various media outlets locally and globally. Whether by print, , or digital exposure we take the highly vetted photography and videography and strategically garner attention from qualified buyers. 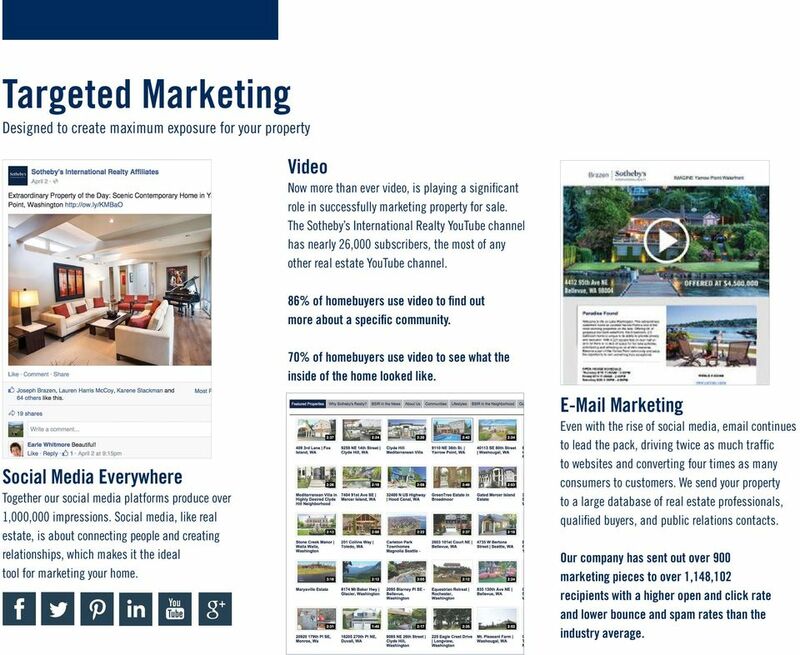 8 Property Distribution We Syndicate Differently Then Report the Results To increase the potential for your home to be found by the most qualified real estate consumers, the Sotheby s International Realty brand has partnered with and distributes properties to the most significant media companies and real estate-focused websites in the world. 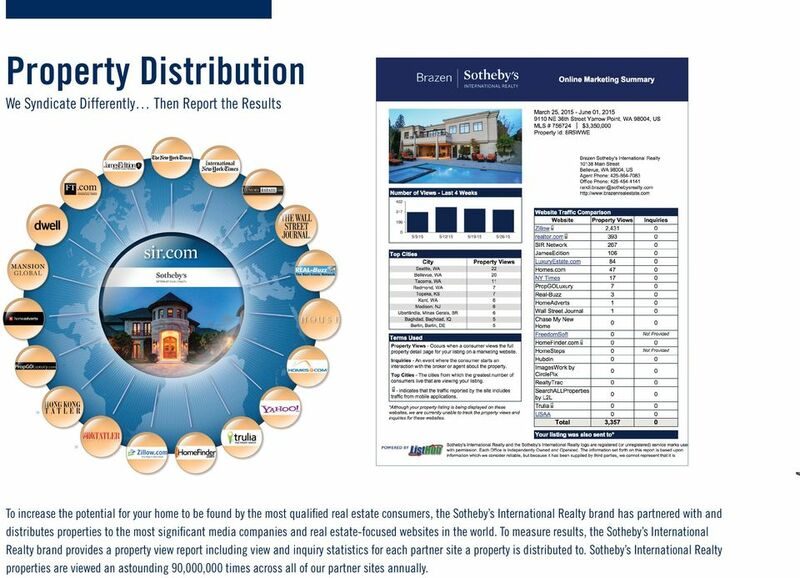 To measure results, the Sotheby s International Realty brand provides a property view report including view and inquiry statistics for each partner site a property is distributed to. 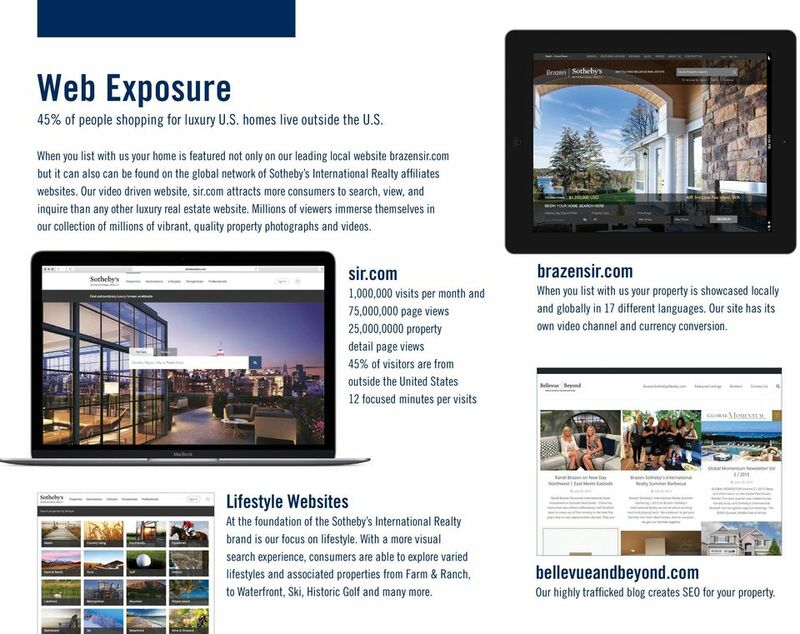 Sotheby s International Realty properties are viewed an astounding 90,000,000 times across all of our partner sites annually. 9 Web Exposure 45% of people shopping for luxury U.S. homes live outside the U.S. When you list with us your home is featured not only on our leading local website brazensir.com but it can also can be found on the global network of Sotheby s International Realty affiliates websites. Our video driven website, sir.com attracts more consumers to search, view, and inquire than any other luxury real estate website. Millions of viewers immerse themselves in our collection of millions of vibrant, quality property photographs and videos. sir.com 1,000,000 visits per month and 75,000,000 page views 25,000,0000 property detail page views 45% of visitors are from outside the United States 12 focused minutes per visits brazensir.com When you list with us your property is showcased locally and globally in 17 different languages. Our site has its own video channel and currency conversion. Lifestyle Websites At the foundation of the Sotheby s International Realty brand is our focus on lifestyle. With a more visual search experience, consumers are able to explore varied lifestyles and associated properties from Farm & Ranch, to Waterfront, Ski, Historic Golf and many more. bellevueandbeyond.com Our highly trafficked blog creates SEO for your property. 10 Targeted Marketing Designed to create maximum exposure for your property Video Now more than ever video, is playing a significant role in successfully marketing property for sale. The Sotheby s International Realty YouTube channel has nearly 26,000 subscribers, the most of any other real estate YouTube channel. 86% of homebuyers use video to find out more about a specific community. Social Media Everywhere Together our social media platforms produce over 1,000,000 impressions. Social media, like real estate, is about connecting people and creating relationships, which makes it the ideal tool for marketing your home. 70% of homebuyers use video to see what the inside of the home looked like. Marketing Even with the rise of social media, continues to lead the pack, driving twice as much traffic to websites and converting four times as many consumers to customers. We send your property to a large database of real estate professionals, qualified buyers, and public relations contacts. Our company has sent out over 900 marketing pieces to over 1,148,102 recipients with a higher open and click rate and lower bounce and spam rates than the industry average. 11 Our Commitment to You Communication is Key We use client-centric management reports, marketing collateral and monitoring tools to eliminate data entry and errors. 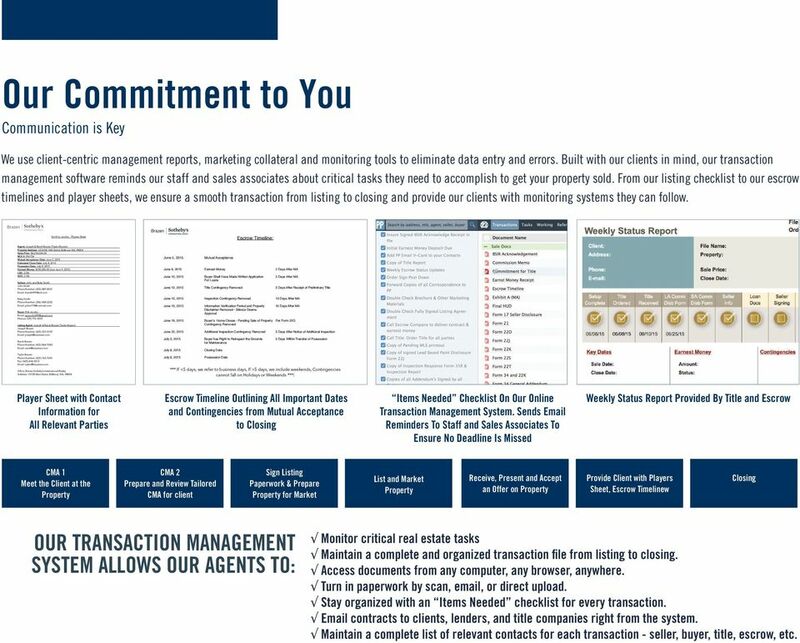 Built with our clients in mind, our transaction management software reminds our staff and sales associates about critical tasks they need to accomplish to get your property sold. From our listing checklist to our escrow timelines and player sheets, we ensure a smooth transaction from listing to closing and provide our clients with monitoring systems they can follow. Smith to Jacobs - Players Sheet Escrow Timeline: Agent: Joseph & Randi Brazen (Taylor Brazen) Property Address: 1234 NE 10th Street, Bellevue WA Sales Price: $4,250, MLS #: Mutual Acceptance Date: June 5, 2015 Estimated Close Date: July 8, 2015 Possession Date: July 8, 2015 Earnest Money: $100, (due June 9, 2015) LOC: 2.5% SOC: 2.5% Sellers: John and Betty Smith John Smith Phone Number: (425) June 5, 2015 Mutual Acceptance June 9, 2015 Earnest Money 2 Days After MA June 12, 2015 Buyer Shall Have Made Written Application 5 Days After MA For Loans June 12, 2015 Title Contingency Removed 5 Days After Receipt of Preliminary Title Betty Smith Phone Number: (206) Buyer: Erik Jacobs Phone:( 509) Listing Agent: Joseph & Randi Brazen (Taylor Brazen) Joseph Brazen Phone Number: (425) Randi Brazen Phone Number: (425) June 15, 2015 Inspection Contingency Removed 10 Days After MA June 15, 2015 Information Verification Period and Property 10 Days After MA Disclaimer Removed - Silence Deems Approval June 16, 2015 Buyer s Home Closes - Pending Sale of Property Per Form 22Q Contingency Removed Additional Inspection Contingency Removed 5 Days After Notice June 22, 2015 of Additional Inspection July 3, 2015 Buyer has Right to Reinspect the Grounds 5 Days Within Transfer of Possession for Maintenance July 8, 2015 Closing Date Taylor Brazen Phone Number: (425) Fax: (425) Office: Brazen Sotheby s International Realty Address: Main Street, Bellevue, WA July 8, 2015 Possession Date *** If <5 days, we refer to business days, If >5 days, we include weekends, Contingencies cannot fall on Holidays or Weekends ***! Player Sheet with Contact Information for All Relevant Parties Escrow Timeline Outlining All Important Dates and Contingencies from Mutual Acceptance to Closing Items Needed Checklist On Our Online Transaction Management System. Sends Reminders To Staff and Sales Associates To Ensure No Deadline Is Missed Weekly Status Report Provided By Title and Escrow CMA 1 Meet the Client at the Property CMA 2 Prepare and Review Tailored CMA for client Sign Listing Paperwork & Prepare Property for Market List and Market Property Receive, Present and Accept an Offer on Property Provide Client with Players Sheet, Escrow Timelinew Closing OUR TRANSACTION MANAGEMENT SYSTEM ALLOWS OUR AGENTS TO: Monitor critical real estate tasks Maintain a complete and organized transaction file from listing to closing. Access documents from any computer, any browser, anywhere. Turn in paperwork by scan, , or direct upload. Stay organized with an Items Needed checklist for every transaction. contracts to clients, lenders, and title companies right from the system. Maintain a complete list of relevant contacts for each transaction - seller, buyer, title, escrow, etc. Heritage Sotheby s International Realty. For the ongoing collection of life. Making A Difference In 90 Days. Making Contact. How will you keep in touch with clients and prospects?